NoTaxForTracks Pinellas kicked off their official campaign this week opposing the county referendum to increase Pinellas sales tax by 14%. Most of that money would go to fund a high cost light rail system from Clearwater to St. Petersburg and there are exactly NO plans to go over the Howard Frankland bridge. It was nice to see that the Tampa Bay Times in their report acknowledged the brand name "NoTaxForTracks". 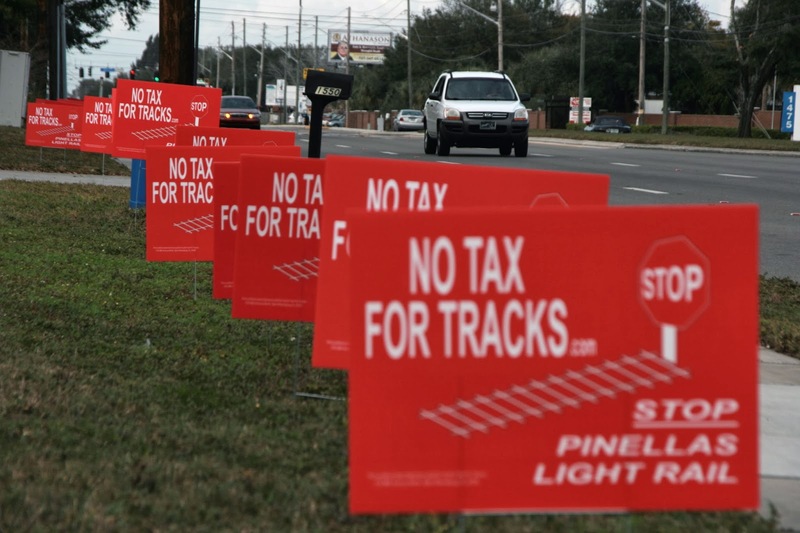 If the name of the campaign, "No Tax for Tracks," sounds familiar, that's because it's the second generation of the Hillsborough-based group that worked to successfully defeat a similar referendum in 2010. There, residents defeated a ballot measure 58 percent to 42 percent that would have raised the sales tax to pay for light rail, expanded bus service and road improvements. 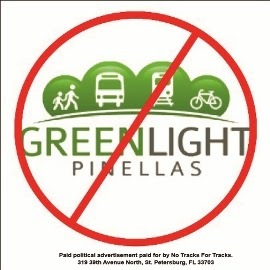 A taxpayer funded pro rail advocacy campaign Greenlight Pinellas was launched mid last year. Ironically, as the Eye previously reported, Greenlight Pinellas may be having a negative impact to their effort as support has dropped since their campaign begun. It is a longer campaign cycle and it is unknown whether that will help or hurt either side. However, as previously stated, the more information Pinellas voters and taxpayers have learned, the more they appear to oppose the referendum. The opposition NoTaxForTracks PAC in Pinellas has been created prior to the pro rail PAC being announced. Just like the taxpayer funded marketing campaign of Greenlight Pinellas, it should be disturbing to taxpayers and voters that Ronnie Duncan, who is chairman of the taxpayer funded Tampa Bay Area Regional Transportation (TBARTA) agency is leading the effort to create the formal pro rail advocacy PAC. Supporters of the tax increase have yet to launch a formal campaign, though efforts to create one are underway, according to Ronnie Duncan, chairman of the Tampa Bay Area Regional Transportation Authority, who is leading the effort and has declined to say how much money advocates have raised. In an interview earlier this month, Duncan said he expected opponents of the referendum would begin spreading their message early. While the referendum's supporters are counting on many of Pinellas' business and political leaders to make large contributions to an advocacy campaign, the opposition does not have the same deep pockets. Similarly, in 2010, Hillsborough's No Tax for Tracks group raised only $24,000, while the pro-transit group Moving Hillsborough Forward collected nearly $1.6 million to promote the issue. What gets totally avoided and intentionally ignored in these rail boondoggles is the fiscal aspect, as if money does not matter. Just like in 2010, the pro rail contingent refuses to acknowledge the high cost to build, maintain and operate a light rail system. Light rail is the highest subsidized mode of transportation. Politicians and taxpayer funded agencies advocating for rail see large amounts of federal dollars dancing in their heads without regard to the cost, effectiveness or efficiency for use of YOUR tax dollars. Special interests see their pockets being lined at the expense of the taxpayer. What we knew in 2010 in Hillsborough is the same today in Pinellas - that light rail has nothing to do with transportation and everything to do with taxpayer subsidized transit-oriented development. This was confirmed by Brad Miller, CEO of PSTA at a meeting I attended last summer where he honestly acknowledged why rail is part of their initiative - the rail component is necessary for economic development. But economic development does not equate to economic growth or prosperity or long term job creation. Don't be fooled by their use of the term economic development. The Pinellas taxpayers should be aware that the sales tax revenue will go directly to Pinellas county because PSTA cannot collect sales tax. The ballot language in the referendum contains NO accountability nor financial/cost information. Don't you want to know where and how the next billions of your tax dollars are going to be spent for this initiative? This lack of transparency should be a red flag to voters and taxpayers. According to this Tampa Tribune article published on January 21st, Pinellas must close a budget gap beginning in 2015. County officials are projecting they will have to make up a $4 million shortfall in 2015, despite a projected 3 percent increase in property tax revenue and a 4 percent increase in sales tax collections. Commissioners did not discuss how to make up any deficit this year, but with a referendum looming in November on raising the sales tax to pay for expanded transit, they may be reluctant to raise property taxes as they did in 2013 when facing an $8.3 million shortfall. Then they raised the general fund property tax rate by 5 percent. That was despite a 3.4 percent increase in property taxes, the first in five years. The budget included a pay raise of roughly 2.8 percent for county employees. The Pinellas Suncoast Transit Authority plans to raise its tax rate by 30 percent (emphasis mine), but is likely still to curb service on some routes. The tax roll, which shed 4.5 percent of its value this year, reduced the transit service's prime source of money. PSTA officials have said the rate increase could stanch the bleeding of reserve money until they persuade voters to approve a sales tax increase (emphasis mine). Pinellas county revenue is up but a budget gap looms. Why? Because as Barbara Haselden explains in this video from the NoTaxForTracks Pinellas kick off event, Pinellas county has a spending problem not a revenue problem. Barbara's presentation is a scathing indictment of PSTA's fiscal mismanagement using PSTA's own information. Now the question becomes should taxpayers trust Pinellas County/PSTA with an additional $100 million a year of your tax dollars to spend? They've already raised property taxes but continue spending. There's no disciplined accountability in place with their rail referendum. Shouldn't fiscal due diligence and prudence be done first? Because as Haselden indicated at her kickoff, this 14% sales tax increase looks more and more like a bailout for PSTA's fiscal mismanagement. Second verse, same as the first. Proving yet again, the politicians are incapable of learning a new tune. But like the old Kenny Loggins tune said they're "gonna take you right into the (taxing) danger zone!"